Group Visits at The Inn at Penallt01600 772765work Group VisitsThe Inn at Penallt is in a unique location adjacent to the Gwent Wildlife Trust nature reserve with open access directly from the large Inn garden (with spectacular views towards the Wye Valley). The reserve details can be found on their website, but has a wide variety of rare plants (orchids etc) and a wide range of wildlife. The area is therefore excellent for walking groups / birdwatching etc. We offer a perfect base for your Wye Valley group travel, with fantastic food from our menu and Afternoon Tea upon request. We look forward to welcoming you. 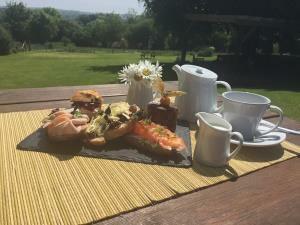 The Inn at Penallt is in a unique location adjacent to the Gwent Wildlife Trust nature reserve with open access directly from the large Inn garden (with spectacular views towards the Wye Valley).